As parents, the most important thing for us is the health of our children. Parents want to assure that their children are healthy, strong and energetic in every possible form. However, a common mistake most of the parents make is they do not pay enough attention to the oral care of their children.This is the reason that even after consuming a relatively healthy diet most of the children suffer from oral care health problems. Here we have some of the important oral care habits that you should teach your children from a very early stage of their lives. Most of the parents teach their children to brush in the morning after the breakfast but they ignore brushing the teeth at night. Brushing at night is equally or more important due to many reasons. Saliva flow is very low during sleep and it doesn’t clear the food particles or have the protective action during sleep. Leaving food particles in your mouth at night and the action of bacteria on these cause cavities in teeth. Therefore it is vital to brush and clean at night after the last meal of the day. Teach your children to avoid snacking after brushing and only to consume water before sleep. It is important to teach your children that oral care routine will always be incomplete without flossing. When the teeth are growing closely together between the ages of 3 to 7 parents should help to floss until the children develop the manual dexterity. Children are ready to floss by themselves around the age of 10. There are many small food particles stuck in between the teeth those cannot be removed by brushing alone. Interdental cleaning such as flossing is important. With the help of floss, you will be able to remove all the particles that might lead to bad breath in the morning Flossing once daily is very important for proper oral care It is important that you teach your child the right technique of flossing. Teach them to floss in a way that the thread will not hurt their gums while cleaning the teeth. Sweets are the biggest enemy of healthy teeth sweets should be limited to special occasions and consumed in limited quantities. Some children love to eat sweets and if you will stop them they will still keep eating sweets. It is better that parents try to teach children, how sweets can cause tooth decay and many other health problems. Allow them to have sweets but in a limited quantity and teach your child to clean their teeth after consumption of sweets. Introduce healthy snacks like fruits and veggies to kids as an alternative to sweet snacks. Limit intake of sugary drinks, fruit juices, acidic soft drinks and energy drinks. Encourage your children to drink plenty of water or milk. Cultivating healthy eating habits from early on life lays the foundation for generations of a healthy population. It is important to have your child’s first dental visit before the age of 3. Generally, the first dental visit should be 6 months after the emergence of the first baby tooth. 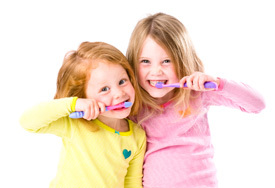 This is to make sure you are doing the right things to help your child’s oral care health. An early introduction will help the children to get familiar with the dental setup and build up positive relationships with the dental care team. With older children make the dental visits a fun-filled positive experience. If they are already scared of dental visits as parents help them to overcome the fear of dentist by talking to them and positive role modelling.Teach them that dentist is their friend and only he can help to keep your teeth healthy. When your children will learn the importance of visiting the dentists they will surely go with you every time. It is the habit that will help your child to continue the routine even as an adult and when you are not there to take him to the dentist. If you teach your children all these habits at an early age they will develop these as a routine. Children will know that they have to follow oral care routine in order to maintain a healthy mouth and beautiful smile. You are the best role model for your children. Cultivate good oral care health habits as parents and your children will follow you.